(Phys.org) —Detecting alien worlds presents a significant challenge since they are small, faint, and close to their stars. The two most prolific techniques for finding exoplanets are radial velocity (looking for wobbling stars) and transits (looking for dimming stars). 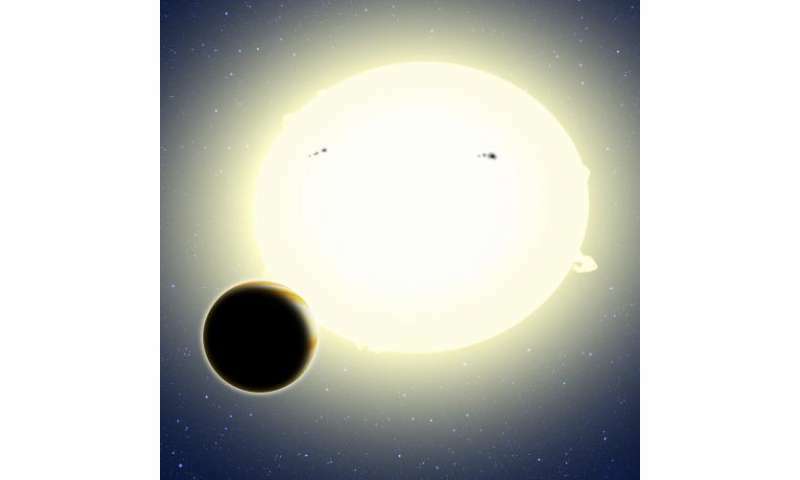 A team at Tel Aviv University and the Harvard-Smithsonian Center for Astrophysics (CfA) has just discovered an exoplanet using a new method that relies on Einstein's special theory of relativity. "We are looking for very subtle effects. We needed high quality measurements of stellar brightnesses, accurate to a few parts per million," said team member David Latham of the CfA. "This was only possible because of the exquisite data NASA is collecting with the Kepler spacecraft," added lead author Simchon Faigler of Tel Aviv University, Israel. The new method looks for three small effects that occur simultaneously as a planet orbits the star. Einstein's "beaming" effect causes the star to brighten as it moves toward us, tugged by the planet, and dim as it moves away. The brightening results from photons "piling up" in energy, as well as light getting focused in the direction of the star's motion due to relativistic effects. "This is the first time that this aspect of Einstein's theory of relativity has been used to discover a planet," said co-author Tsevi Mazeh of Tel Aviv University. The team also looked for signs that the star was stretched into a football shape by gravitational tides from the orbiting planet. The star would appear brighter when we observe the "football" from the side, due to more visible surface area, and fainter when viewed end-on. The third small effect was due to starlight reflected by the planet itself. Once the new planet was identified, it was confirmed by Latham using radial velocity observations gathered by the TRES spectrograph at Whipple Observatory in Arizona, and by Lev Tal-Or (Tel Aviv University) using the SOPHIE spectrograph at the Haute-Provence Observatory in France. A closer look at the Kepler data also showed that the planet transits its star, providing additional confirmation. "Einstein's planet," formally known as Kepler-76b, is a "hot Jupiter" that orbits its star every 1.5 days. Its diameter is about 25 percent larger than Jupiter and it weighs twice as much. It orbits a type F star located about 2,000 light-years from Earth in the constellation Cygnus. The planet is tidally locked to its star, always showing the same face to it, just as the Moon is tidally locked to Earth. As a result, Kepler-76b broils at a temperature of about 3,600 degrees Fahrenheit. Interestingly, the team found strong evidence that the planet has extremely fast jet-stream winds that carry the heat around it. As a result, the hottest point on Kepler-76b isn't the substellar point ("high noon") but a location offset by about 10,000 miles. This effect has only been observed once before, on HD 189733b, and only in infrared light with the Spitzer Space Telescope. This is the first time optical observations have shown evidence of alien jet stream winds at work. Although the new method can't find Earth-sized worlds using current technology, it offers astronomers a unique discovery opportunity. Unlike radial velocity searches, it doesn't require high-precision spectra. Unlike transits, it doesn't require a precise alignment of planet and star as seen from Earth. "Each planet-hunting technique has its strengths and weaknesses. And each novel technique we add to the arsenal allows us to probe planets in new regimes," said CfA's Avi Loeb. Kepler-76b was identified by the BEER algorithm, whose acronym stands for relativistic BEaming, Ellipsoidal, and Reflection/emission modulations. BEER was developed by Professor Tsevi Mazeh and his student, Simchon Faigler, at Tel Aviv University, Israel. The paper announcing this discovery has been accepted for publication in The Astrophysical Journal and is available online.